Domestic Shipping Rates (FedEx Home Delivery / FedEx Express) Orders received by 9:00 AM EST will be usually ship the same day if in stock. Orders received after 3:00 PM EST will usually ship out the following business day. When we are busy, orders can take up to 2 business days to be processed. Unfortunately, at this time we do not ship orders on weekends and holidays. All rates are for Business Day delivery. You order a package on Monday lunchtime that takes 2 business days to arrive. If in stock, it will be processed and then shipped out on Tuesday, so your package would arrive on Thursday, the second business day after the ship date. Fedex Home Delivery delivers Tuesday through Saturday (not Sunday and Monday). Fedex Standard Overnight does not deliver on Saturday. Fedex Priority Overnight DOES deliver on Saturday. FedEx cannot deliver to PO Box or APO addresses. Delivery Time: We make every effort to deliver your package to you as soon as possible. However, there are conditions which may cause delays. Credit Card Approval: AFTER your order has been confirmed and authorized, it will be processed and shipped out to you within 24-48 hours. Inconsistent credit card, billing and/or shipping information may delay your order. International Orders. When your order is packed and ready to ship, we will capture your funds and then ship the following day. Cutoff Time: Orders received after 9:00 AM EST may be processed the next business day. FedEx Home Delivery/Ground Service: Delivery to some destinations may take up to seven business days. 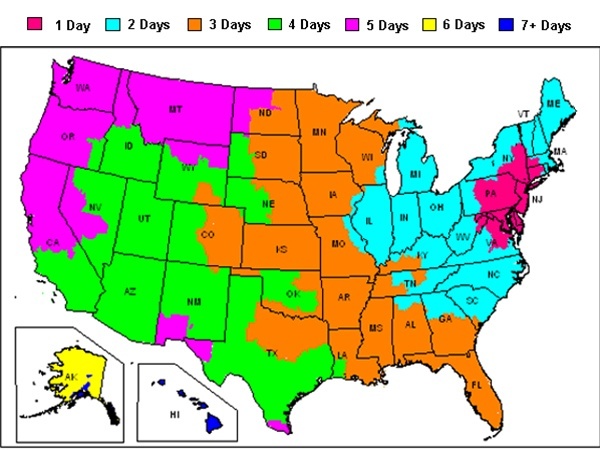 Generally, most metropolitan areas should receive delivery within four to five business days. Expect Order Processing to take up to 2 business days.